The matrix of this natural color pegmatite decorator specimen is white albite feldspar. There are a few dozen pink tourmaline crystals intergrown with the albite matrix. Some of these pink tourmaline crystals grade into green tourmaline at one end! The pink tourmalines are mostly translucent, and the largest pink tourmaline measures 7.8 inches long!! See also another view of this natural decorator specimen of tourmaline crystals in albite. Pegmatite Specimen Dimensions: 8.7" long x 6.3" x 5"
This is a very beautiful pegmatite decorator mineral specimen consisting of blocky muscovite mica crystals on albite matrix. There also is a 0.9 inch long quartz crystal peeking out from behind some of the muscovites. On the bottom of this natural pegmatite mineral specimen there is some black tourmaline as well. See a full view photo of this natural decorator specimen of muscovite mica on albite. There are dozens of large intergrown muscovite mica crystals with interesting hexagonal shapes. See another view of this fine quality pegmatite decorator specimen of mica crystals on albite. Pegmatite Specimen Dimensions: 10.2" long x 8.3" x 3.5"
This natural pegmatite decorator specimen has a white albite matrix with naturally terminated diamond shaped muscovite mica crystals and white albite feldspar crystals. The albite matrix is a mass of intergrown triclinic albite crystals with a small amount of quartz. This natural mineral specimen was found in a tourmaline bearing pegmatite in Minas Gerais, Brazil. It is a very attractive decorator mineral specimen! Clevelandite Specimen Measurements: 7.5" x 7" x 4.5"
This beautiful decorator specimen is a mass of white blade-like clevelandite crystals on a matrix of white albite with a small amount of quartz and muscovite mica. This unique decorator specimen has greenish gold muscovite mica crystals perched on the front and sides of a light brown albite feldspar matrix specimen. This beautiful pegmatite specimen is completely natural with no treatments of any kind. See also a side view of this decorator mineral specimen of mica on albite. This large decorator specimen has greenish gold muscovite mica crystals perched on a light brown albite feldspar matrix. This beautiful pegmatite specimen is completely natural with no treatments of any kind. See also another view of this beautiful decorator mineral specimen of muscovite on albite. 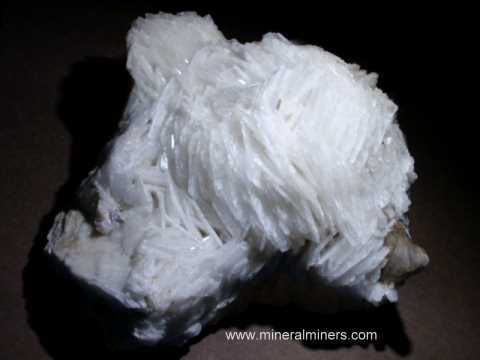 This natural pegmatite mineral specimen is a large cluster of muscovite mica crystals intergrown with some white clevelandite (a variety of albite feldspar). This large pegmatite specimen is completely natural with no treatments of any kind. There are some rounded clevelandite formations on top of the muscovite crystals on the back side. This unique specimen has a large stalagmitic muscovite crystal formation standing up from the matrix as shown. See also a back view of this natural decorator specimen of muscovite with albite. This beautiful decorator specimen stands up nicely in the position shown. It has rounded masses of blade-like white clevelandite crystals attached to a large partially terminated microcline crystal. This unique specimen is completely natural with no treatments of any kind. This beautiful pegmatite specimen is very showy with the brilliant white clevelandite and the beige color microcline feldspar. There are hundreds of small muscovite mica crystals attached on the backside. See also a back view of this pegmatite decorator specimen of clevelandite with microcline. This large decorator specimen has rounded masses of blade-like white clevelandite crystals on a partially terminated microcline plate. It is completely natural with no treatments of any kind. This beautiful pegmatite specimen is very showy with the brilliant snowy white clevelandite on top of the beige color microcline feldspar. This is the end of our Spectacular Albite & Clevelandite Decorator Specimens page. Albite and clevelandite specimens make beautiful decorator pieces! We do have additional inventory of natural albite matrix specimens in stock. We also have some giant size albite and clevelandite decorator specimens weighing over 1000 pounds! For further info or requests, simply contact us by email about our clevelandite decorator specimens. To see more albite photos, just select another item category from the table below. Would you like us to inform you when we add more rare quality clevelandite specimens and large size decorator pegmatite specimens of natural albite on this page? We do have additional inventory of large size decorator mineral specimens of natural clevelandite in stock, so be sure to let us know if you have any natural albite mineral specimens special requests. Please contact our webmaster or our 'site' geologist with any questions or comments.